Is it called a Swing Bed, a Bed Swing, a Swinging Bed, or maybe a Swingbed? Whatever you call it, it’s way fun, easy to make, and a place you’ll want to spend many a lazy summer afternoon. 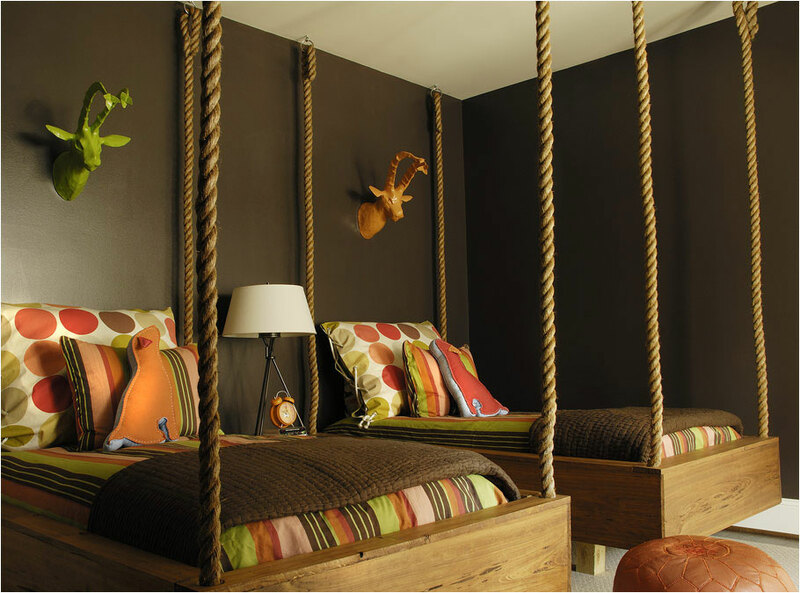 My fascination with swing beds goes way back, here is a previous post with more swing bed ideas! Call me modest or old-fashioned, but I still kind of prefer one bed per room myself. This sleeping porch is designed for a camping-like experience for summer nights at the lake. It looks like fun. The beds themselves use chain for support. While that probably will last awhile, chain presents a couple of issues: pinching, rusting, noise, and no flexibility meaning a very firm base for the bed. I think heavy rope would be better, but it wouldn’t last as long. This is just un-be-lievable! I want this. I love the attention to detail and unique features of this. I’m guessing that the column/legs on the corners are upcycled from a down-and-out previously awesome piece, but they may be made just for this. Either way, yes. The thin-ish rope (about 3/8″ – 1/2″ thick by the look of it) wrapped around the rails is just owning me. I’m not even going to be able to sleep without dreaming of the awesomeness which is this rope-wrapped bed rail. The perfectly frayed “tassle” ends on the hanging ropes. Somebody was on fire when they built this thing. Not to mention the awesome stained concrete floor, the perfect weathered wood window casings, or the so-fab-it-should-be-outlawed roof structure. Twenty years from now you’ll be able to read a story, maybe even watch a movie, about one man’s quest to find the perfect swing bed he saw in a picture one day. Though I’m seeing imaginary youtube videos of the moment I find it and plop down the rope breaks. I think these particular hanging ropes are a little too thin for a person of my, ehem, stature. This looks awesome! While not technically a swing bed, what a great looking room and fun for three boys to share. I almost didn’t share this image, however. The reason is the safety concern of this design. A regular thinking person (as compared to a structural engineer) might not grasp the tension on the point where the rope attaches to the wall. In technical terms: It’s a ton of weight! If I were to build this, I would be wanting to reinforce the framing at the point of connection and use a bolt with a ginormous washer on the backside of a 2×4 (inside the wall). You could also use the ladder for extra strength by making it permanently fixed in place. Of course it all depends on the size and bouncy tendancy of the boys in question! Just be careful not to underestimate the forces at play! If you want the look of a swing bed without the actual swing and without worrying about the rope pulling free or breaking, then this idea is for you! These beds aren’t actually hanging on the ropes, they’re resting on 4×4 (maybe 6×6) legs under the center of the bed, combined with strong attachments at the wall to create the illusion of a hanging bed. The way the ropes are connected to the rings on the ceiling… no strength there. The ropes aren’t perfectly taut, no tension there. Then, of-course, there is the fact that you can see one of the legs in the picture!. I can’t decide what to think about this one. Part of me says that if Anthro ever sold it it must be so stylish as to be out of my league. On the other hand, since they don’t make it anymore maybe it’s not so hot. I thought about creating a set of plans to build this puppy but the closer I look at it, the more complex it gets. If you’ve got the skeelz to build this one, you probably don’t need any plans to guide you. I love the big fluffy mattress. It looks like a great place to read a book or write a blog post! Me lounging on the daybed swingy thingy instead of awesome designer Rachel Halvorson. I’ve been staring at the design of this swing for awhile because I think it’s darn near perfect. Luckily, I was able to find another picture! Nice setting for the sitting! So, what do you think about the idea of beds that hang from the ceiling? Good for outside only, or inside too? Just for kids or will one of these bring the kid in all of us right out? I think my favorite is the one by the beach (#2). I’m a sucker for the crystal clear water and bright white sand in my toes. Which one tugs at your heart? Hi Frank, do you have plans on how to build the swing bed? If so please share. I am married to a very smart man but he is NO carpenter so I would like for this to be a joint effort maybe a Saturday project we can do together without killing one another. Wow, crazy day for us! An old client came in today showing us a picture of a swing she wanted made that she found off of Pinterest and it ended up being a swing we made for one of our designers, Rachel Halvorson! So beyond thrilled that our furniture has made it throughout the social media world. What a blessing! Hi Will, I am interested in having a swing made very similar to the one above. Can you help? Im in Los Angeles. I too am interested in having a swing made like the one Rachel designed. Can you help? I live in Birmingham. Hi Will, I’m in NZ & can’t find anywhere here to buy a swing chair so thought I would have a go at making one. My brother is very handy when it comes to building any thing with timber so I am sure he will help me. Did you end up sharing your plans with the others? I would love to get a copy of your plans unless you have an outlet in nz?! My honey is not handy but we need one of these beds on our porch. Please tell me how to even begin. I want “Hanging in Style by the Beach”.